The Roaring Forties: Seven Boards in Seven Days is one of several chalkboard series by Tacita Dean that evoke the aesthetic of black and white cinema. 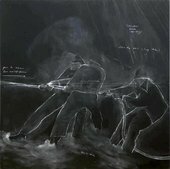 It comprises a sequence of white chalk drawings on seven eight-foot-square Masonite panels that Dean prepared with blackboard paint. The Roaring Forties is the name given to a zone in the southern Atlantic, between 40º and 50º latitude, which is noted for its gale-force winds. Dean used old photographs for reference to construct an epic sea narrative in seven parts, including scenes of a storm, a ship under full sail listing with the wind and a series of muscled figures engaged in such activities as rowing a skiff or climbing in rigging. As with the chalkboards Disappearance at Sea 1995 (Emmanuel Hoffmann Foundation, Basel), and more recently Sea Inventory Drawings 1998 (private collection), Dean draws associations between the language of the storyboard and a more traditional approach to drawing. By giving herself seven days to complete the seven boards for The Roaring Forties, Dean likened the time-bound qualities of film to those of the drawing process. She also demonstrated that reliance on strict editing applies as much to drawing as to film. In The Roaring Forties, the reference to cinematic storyboards is accentuated by the many hand-written directional notations that punctuate the epic scenes. Instructions such as 'aerial view', 'fade up from black' and 'pan to action from out of frame', together with arrows indicating wind direction, prevent the viewer from being absorbed in an unfolding narrative. They also refer beyond the dimensions of the actual surface of each board. This incomplete, suggestive quality and visible traces of cloudy erasure remind the viewer that narrative itself is an unending process of editing and adjustment. Offering us glimpses of an incomplete narrative, The Roaring Forties can also be understood in terms of Dean's fascination with the 'clue'. The 'clue' is often Dean's way into a rich narrative texture, and her work frequently has an investigative edge as she reassembles a trail of evidence in order to separate fact from fiction. The sea often features in her work as a metaphor for the shifting fabric of storytelling itself. Pieces such as Disappearance at Sea 1996 (T07455) and Aerial View of Teignmouth Electron, Cayman Brac 16th September 1998 2000 (P78389) deal with the power, both imaginative and physical of the sea. In Dean's work, the ocean can be seen to have prompted extravagantly romantic, utopian projects while also tragically thwarting them. Frances Richard, 'Tacita Dean: The Drawing Room', Artforum, vol.36, November 1997, p.116, reproduced p.116. Virginia Button and Michela Parkin, The Turner Prize 1998, exhibition brochure, Tate Gallery, London 1998, [pp.4-5], reproduced [p.12].